Do you sometimes long for a crochet blanket pattern that you can work on when in company or watching television? A project that does not require you to count stitches, change color, remember the stitch pattern or anything else that would require you to think about what you are doing? If so, I have just the design for you! My new, free Merry-go-Round blanket pattern using double crochet stitches. The yarn that I am using is Scheepjes Noorse Sokkenwol Colour. This is a thick and warm sock yarn containing 20% wool, 40% acrylic and 40% nylon. The yarn has a gradual color gradient which makes for very interesting color effects on any project. There are 5 colors to choose from and they are all available from Wool Warehouse or your local Scheepjes stockist. I used color 968, which is a playful rainbow colorway, but this blanket will look lovely in any of the other shades also. The color changing yarn is continuously drawing you in and wanting you to know which color is next. I have made a short video showing the steps involved to make my Merry-go-Round blanket. I show the first 3 rounds as well as the crab stitch edge. The pattern is in US crochet terms. If you are more comfortable with UK crochet terms, please see this conversion table for the most common terms. 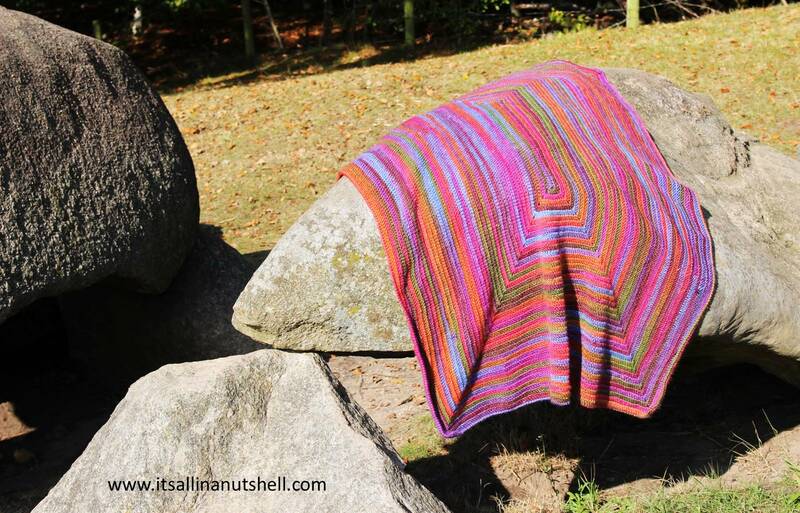 To make this blanket you first make a rectangular center and from there it goes round, and round and round again till you run out of yarn or your blanket is big enough; which ever comes first. ch4 (does not count as a stitch), 50fdc, ch2, 3dc in the bottom of last fdc worked (this makes the short side of the rectangle), ch2, 1dc in same stitch (this is in the bottom of the last fdc worked), 1dc in each of next 49 st (this is the bottom of the fdc stitches and makes the long edge of the rectangle), ch2, 3dc in ch4-space. This makes a rectangle with the following stitch count: 50dc, 3dc, 50dc, 3dc. (2dc, ch2, 1dc) in same ch4-space as the last 3dc’s of Round 1, 1dc in next 50 st, (2dc, ch2, 2dc) in next ch2-space, 1dc in next 3 st, (2dc, ch2, 2dc) in next ch2-space, 1dc in next 50 st, (2dc, ch2, 2dc) in next ch2-space, 1dc in next 5 st. This makes a rectangle with the following stitch count: 53dc, 7dc, 54dc, 7dc. Don’t worry that there is 1 stitch difference between the long sides of the rectangle. You won’t notice this anymore after a few rounds. Repeat from * to * 3 more times. When your blanket is large enough or you are almost out of yarn, work your last round using crab stitches to make a nice edge. For the final corner when repeating Round 3 do not work a full corner, but only work 1dc in the last ch2-space. Work a crab stitch in each st and 2 crab stitches in a ch2-space all the way round. When you get back to your starting point, work 1 crab stitch in the ch2-space containing the last dc worked, 1 crab stitch around the post of the last dc worked, and close with a ss in the first crab stitch. This has been a fun and relaxing project for when I wanted something that needed very little concentration on my part. I believe this to be the perfect crochet-TV project. I would love to see your blanket, please feel free share your work on my Facebook or Instagram, or tag me with #itsallinanutshell so I can find it. (C) Copyright It’s all in a Nutshell. All rights reserved. This pattern is available for unlimited personal use. You may print a copy of the pattern or keep a digital copy for personal use only. Do not reproduce or sell my patterns (either digitally or in print). Do not post my patterns online, either as a complete document or in part. Please refer to back to this pattern by linking to it from your blog or website. You may sell items that you make with as long as you credit me as the designer. To shop owners and yarn sellers : it is not allowed to make kits without my permission. Please do not print copies to distribute with yarn sales as this is an infringement of copyright. The copyright of this free crochet pattern is protected by Scheepjes.com. no, it’s not your ipad. I reloaded them because for some reason totally unknown to me they were not posted in the text properly. Thank you for such a lovely pattern!!! Ive lots of birthday and holiday gifts this will satisfy!!! This is so so pretty Esther. Another beautiful blanket. I am ordering the yarn today. I seemed to have missed the starting chain count? Good day. I would be grateful if you would tell me how many stitches to make at the beginning, for a rug of 34 x 46 cm. No, I can’t tell you exactly because it depends on your tension and the yarn and hook size you use. Because you want a rug that is 12cm wider than it is long, the number of foundation dc stitches must be 12cm long. Then your rug will maintain this difference between the width and the length. Then continue till it is the right size. Looks beautiful but I’m not getting the foundation dc. I hear you saying “the back of the chain”, so is it the horizontal yarn behind the chain loop? Also, where is the link you refer to showing the fdc in slower motion? Thank you so much for your video on fdc! I know understand for the first time how to do it! My hand is recouping from an accident but as soon as I’m able to pick up a hook I’m going to try it. It’s making me nuts not to be able to crochet but I must listen to my doctor. Happy to help you make the stitches you struggle with. I’m on row/round 12, and so far the edges are curling a lot, especially the longer two sides. Also, the shorter two sides seem flared out, that is, if I match up the width of the short side with the middle of the piece, the ends are wider. Will this all even out as it grows? Thanks for advice. Hi Michelle, no, this will not i think. Possibly you have more stitches on those edges than the pattern suggests? Thank you for a relaxing and easy to follow video.